Thousands of protesters gathered in Algiers for an eighth successive Friday to demand the departure of the ruling elite as Algeria prepares for a presidential election in July, Reuters reported. President Abdelaziz Bouteflika stepped down from 20 years in power 10 days ago, bowing to pressure from the army and weeks of demonstrations mainly by young people seeking change in the North African country. 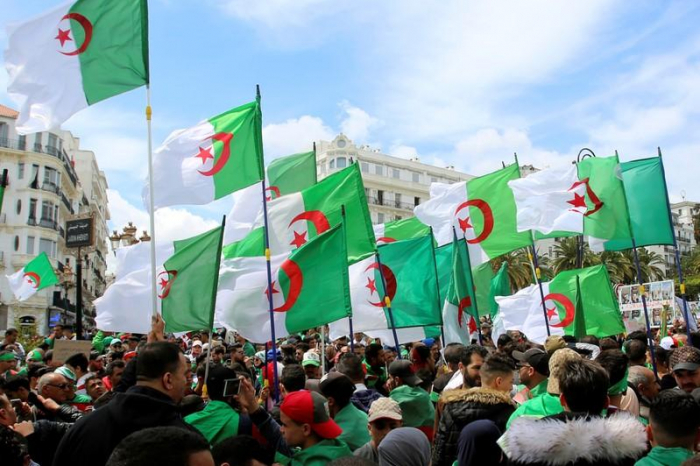 But protests have continued as many want the removal of an elite that has governed Algeria since independence from France in 1962 and the prosecution of what they see as corrupt figures. “No to Bensalah,” the protesters chanted, gathering in the center of Algiers where mass protests broke out on Feb 22. “We want the prosecution of all corrupt people,” one banner read. On Wednesday, Algeria’s army chief, Lieutenant-General Ahmed Gaed Salah, said he expected to see members of the ruling elite prosecuted for corruption and said he would support a transition toward elections. More than one in four people under the age of 30, some 70 percent of the population, are unemployed - one of the central grievances of protesters who want the economy liberalized and diversified to reduce its reliance on its oil and gas production. The army monitored the unrest from the sidelines. Then Salah intervened, declaring Bouteflika - rarely seen in public since suffering a stroke in 2013 - unfit to rule.